The Penn State Project Team had successfully finished inventorying newspapers in 30 central, north central and northeastern Pennsylvania counties on October 15, 1987. The Project Team had visited 462 sites and traveled 14,922 miles before ending the Project on February 26, 1988. Becky Wilson had left the Project in September 1987 and was serving as the Assistant Director at the Blough-Weis Library at Susquehanna University. By March 1, 1988 Sue Kellerman had joined the Penn State University Libraries Acquisitions Department as a Serials Librarian. While neither Becky nor Sue were “officially” with the Pennsylvania Newspaper Project in March 1988, they jumped at the chance to present at the June meeting. 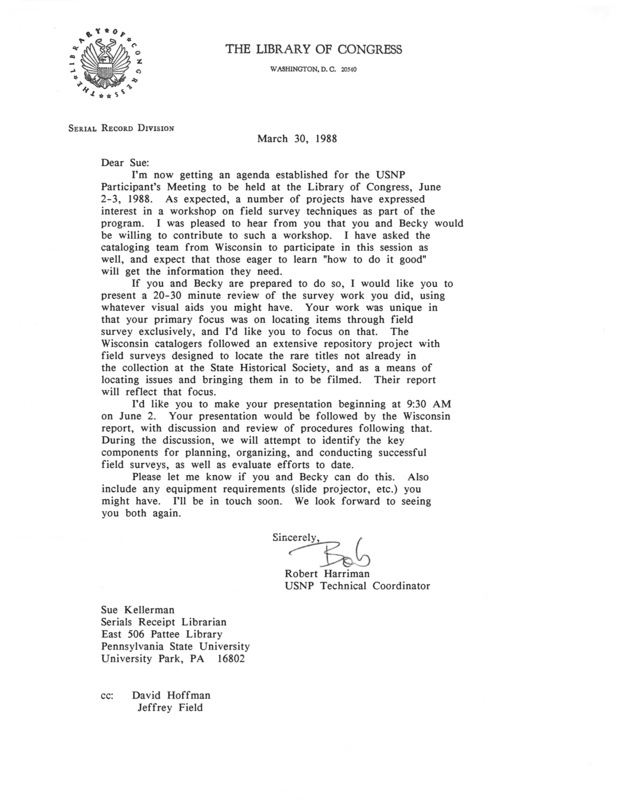 Letter from Bob Harriman to Sue Kellerman officially inviting Sue and Becky to present at the USNP Participant’s Meeting on June 2-3, 1988. The presentation given on June 2, 1988 consisted of an overview of the “Step-by-Step Procedures” that the Project Team followed in conducting field work on a county-by-county basis and the letters and forms they used. Moreover, as new USNP participants joined the national initiative each was given a copy of the following the procedures and the forms.